Why 2 groups? Harmony is a big track, and to be honest I don't like the idea of dividing people into better (more important)/ worse (less important). And also driving with 30 people is more fun than 15. Anyway I'm in, and first 4 places are already booked ;> Force India ftw! It is not a Matter of importance. My rational is the one of ak, session of more than 20 people is not easy to organize with rockstar support capability . Anyway glad you re in ! Note if we are 20 of course only one session Will be Hosted for exemple . Idk, I took part in many events with more than 20 people and it was definitely playable. Obviously disconnections will happen (including me), but it's just the matter of patience. By importance I meant points, and a bit, but still, prestige. I just don't want this crew to have "elitism", which annoyed me in NoDo, where weaker players couldn't play with the best, cause they only played with themselves. We are far from it, but you know... There is this little smell of this feeling with making 2 GP's. Obviously it's unintentional, but if this becomes common, the issue will appear. 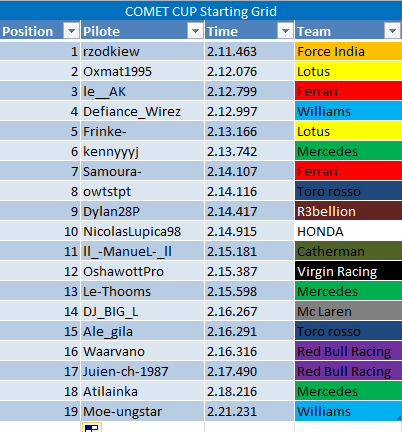 If I was in a skin of a guy, who is always in gp2, I would still want to play with the better ones, but... I wouldn't be allowed. Is it just one race or a series on different tracks each week? Je sais pas si je dois préciser "MCLAREN"
What is your team ale_gila? i choose the Toro Rosso..